All in all, Klaviyo is a very complete tool. 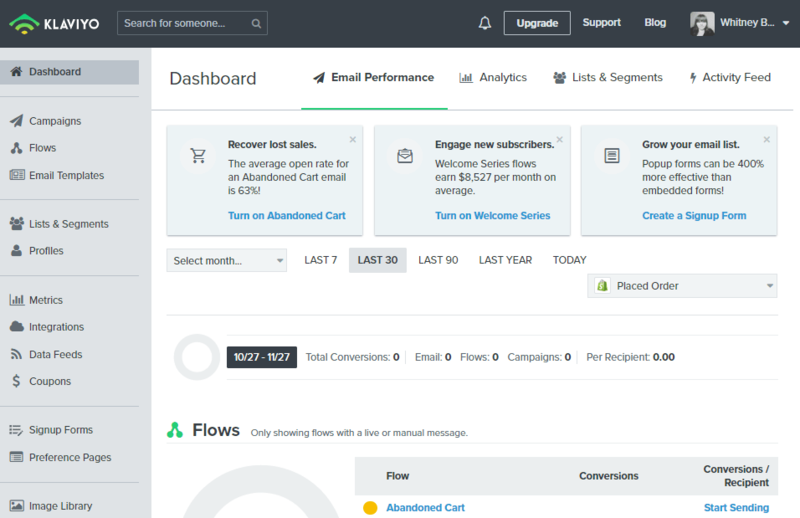 As with many email marketing tools today, Klaviyo offers a suite of marketing automation features, including email campaigns, automated workflows, email capture and popups, advanced segmentation, etc. 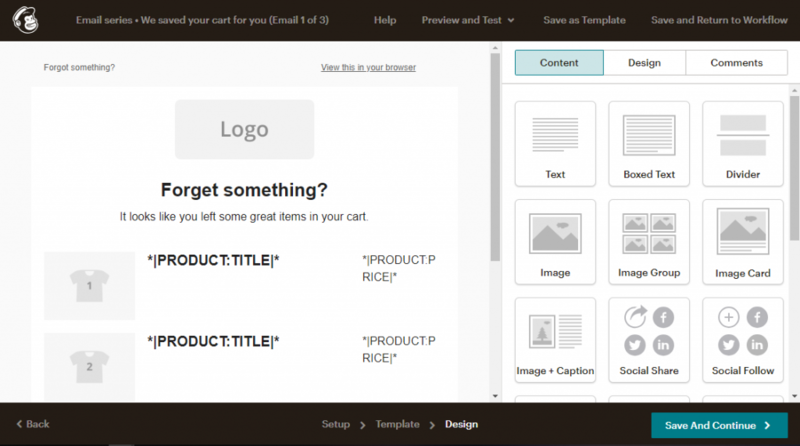 When creating campaigns, they include a drag-and-drop interface that allows you to build emails easily. While the builder is, overall, user friendly, there are some bizarre elements. For example, instead of building a column into an existing content block, you have to add a pre-split block and edit that instead. 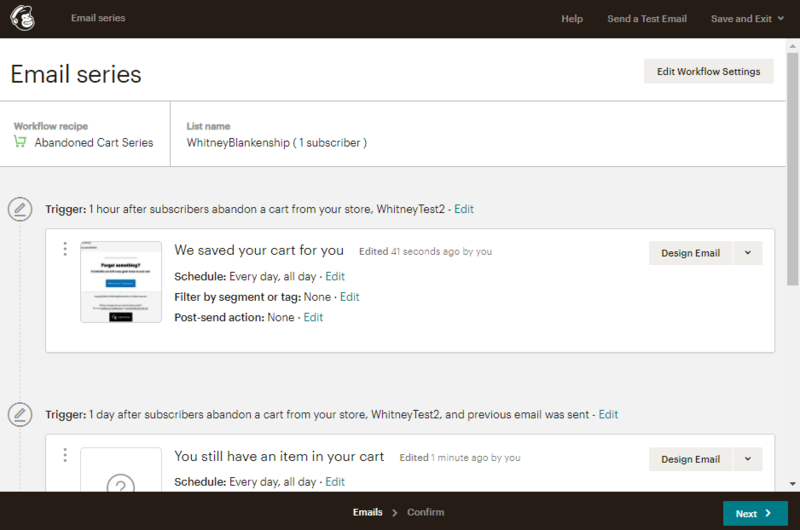 Adding products and customizing the email is pretty easy though. 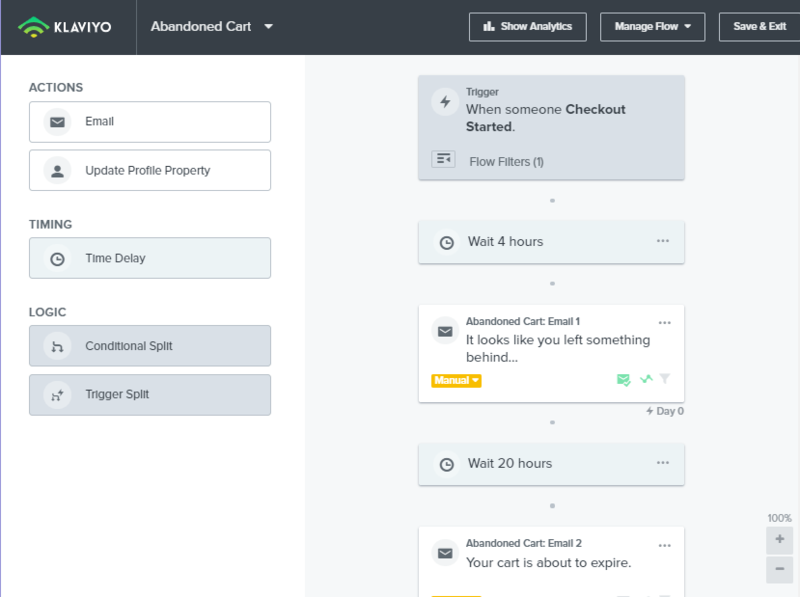 Automated email flows are where Klaviyo shines: they propose different kinds of flows to experiment with when you’re just getting started, for example your abandoned cart and browse abandonment flows. This helps new users get an idea of where they should start. With the ability to create detailed automated flows and precise segmentation, there are tons of things Klaviyo can do. If there’s one thing that turns more people away from Klaviyo than anything else, it’s their pricing. By and large the most expensive tool in this list, pricing can be tricky to work with. They offer a free plan up to a meager 250 contacts and 500 email sends per month, with imposed Klaviyo branding. If you’re really just getting started, it can work well. However, scaling with Klaviyo can get expensive quickly. At 1001 subscribers, Klaviyo jumps to $75 per month, and at 2001, it’s $125/month. The price grows exponentially with your list, no matter what you use or how often you send your emails. You can expect your subscription to go up by $25 for every 500 subscribers you add up to 3000 contacts. After 3000 contacts, the price goes up every 1000 subscribers, but by then, you’re already paying $175 per month. 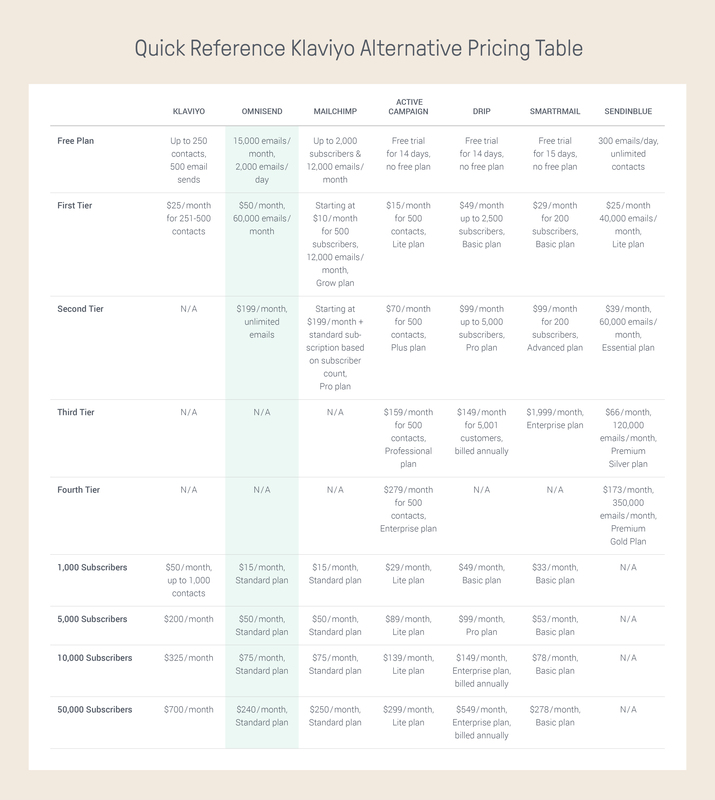 Regardless, Klaviyo’s pricing might put this tool out of your budget. 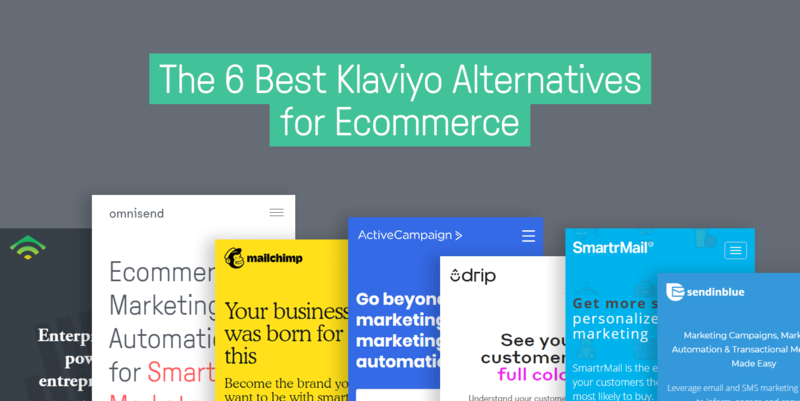 But never fear, there are a few great Klaviyo alternatives you can use that won’t put too much strain on your wallet. 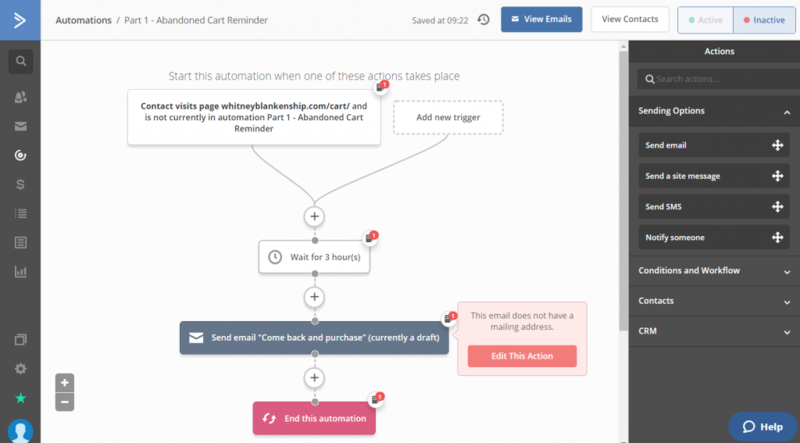 Omnisend is an all-in-one email and marketing automation suite that allows online sellers to create email campaigns in minutes, create complex automation flows, and precisely target their subscribers with smart segmentation. Omnisend is unique in the channels that it includes in its workflows: add SMS to a campaign to pack an extra punch or add Facebook and Google retargeting ads to provide your customers with a truly omnichannel experience. Omnisend is also the only tool in this list that offers dynamic gamification elements to keep your customers engaged. 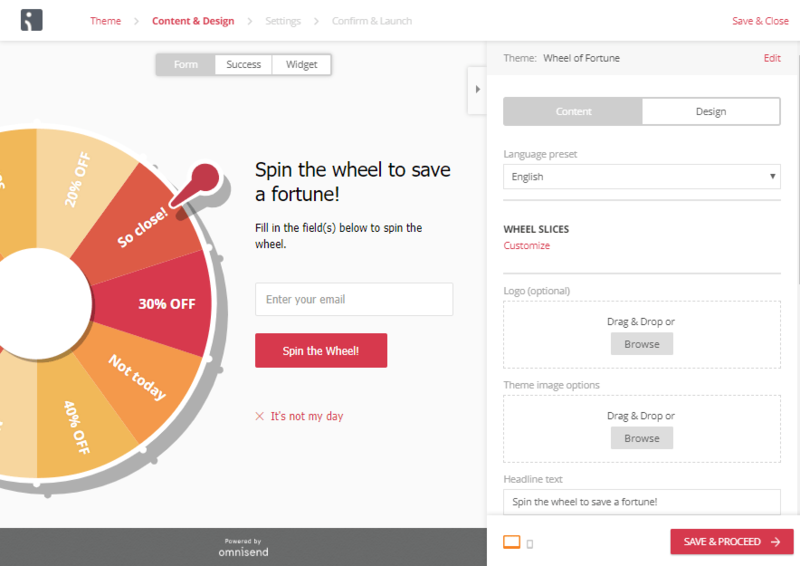 Choose between a gift box or scratch off card for discounts in campaign, or build your email list with a wheel of fortune that only spins when an email address is entered. As a Klaviyo alternative, it doesn’t get better than Omnisend. Able to do everything Klaviyo can do, and more, Omnisend is a fraction of the price, offering a free plan up to 2000 emails per day. 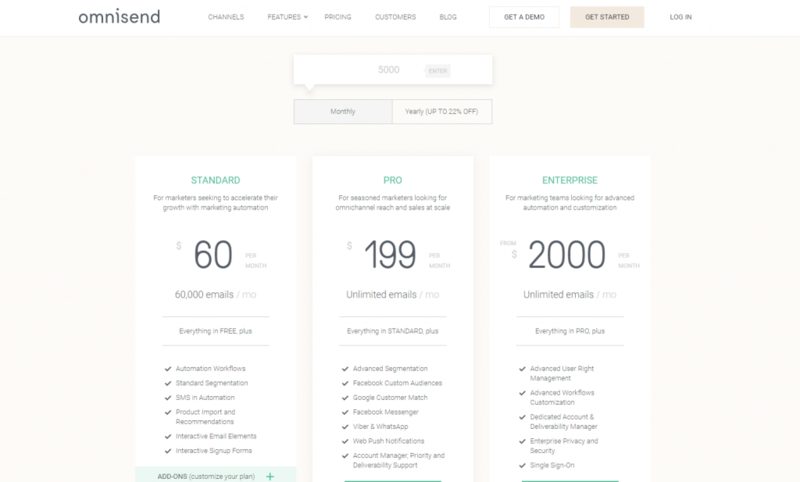 Like most other email marketing automation tools, Omnisend offers their plans based on the amount of subscribers you have. What’s interesting though, is that if you wanted more features, but you don’t have a lot of subscribers, you can actually get the Standard plan for only $16 per month for 500 subscribers. You don’t actually pay the $60 per month until you hit 3000 or more subscribers. The Standard Plan, Omnisend’s first tier, starts off at $60 per month for up to 60,000 emails sent, and is for those who want to do more with marketing automation, plus you can add modules to customize your plan. The Pro plan is a flat $199 per month for unlimited emails, and is for marketers who are interested in using ultra personalization in their campaigns. 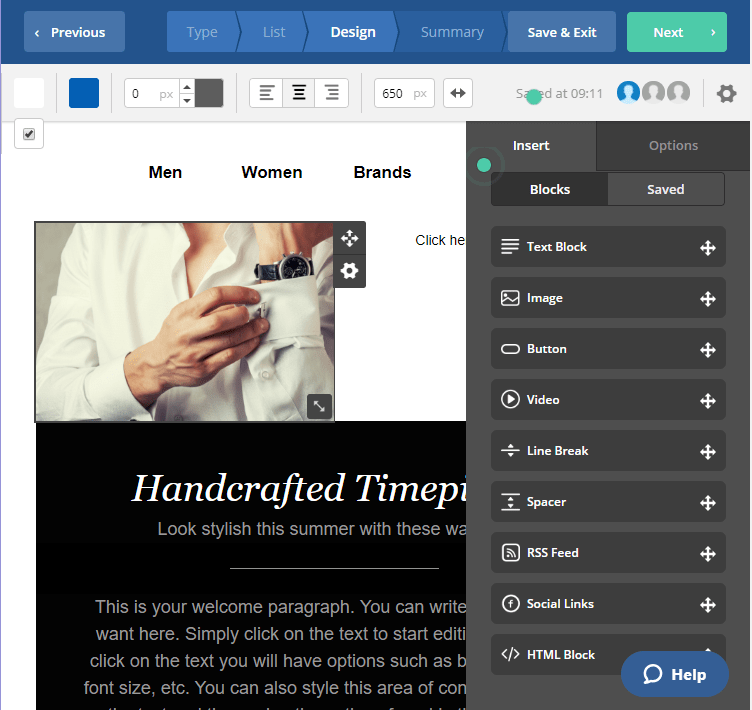 With an easy-to-use visual editor, MailChimp’s emails are easy to create and customize. They also offer unusual channel integrations, like adding Instagram ads to the usual Google and Facebook ads we see with automation tools. Their automation gets the job done, however the workflow could be a bit more clear in terms of visualization and editing. Sometimes, you have to click in a few unexpected places to navigate MailChimp, but there are plenty of tutorials to guide you. For example, to access your automation workflows, you have to go into campaigns, as it’s not it’s own tab in the main menu of your dashboard. As a Klaviyo Alternative, MailChimp will certainly get the job done, but you might just be surprised at how much you end up paying for the tool. 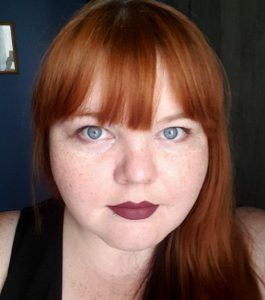 Looking to graduate from MailChimp? Check out this Best 7 MailChimp Alternatives article. By far the award for the most confusing pricing plan goes to MailChimp. While it’s still a far cheaper alternative to Klaviyo, a big pain point for users is simply not understanding how much they’ll end up paying. This seems straightforward at first glance. However the prices noted here are the amounts you pay per month for just the plan itself. After that, you have to factor in the amount of subscribers you have. That $10/month plan is only $10 if you have only 500 subscribers. Granted, it only kicks up by $5 for each 500 subscribers you add, so scaling is a lot easier than Klaviyo, but it’s still a bit frustrating when you consider that MailChimp’s free plan is supposed to include up to 2000 subscribers. 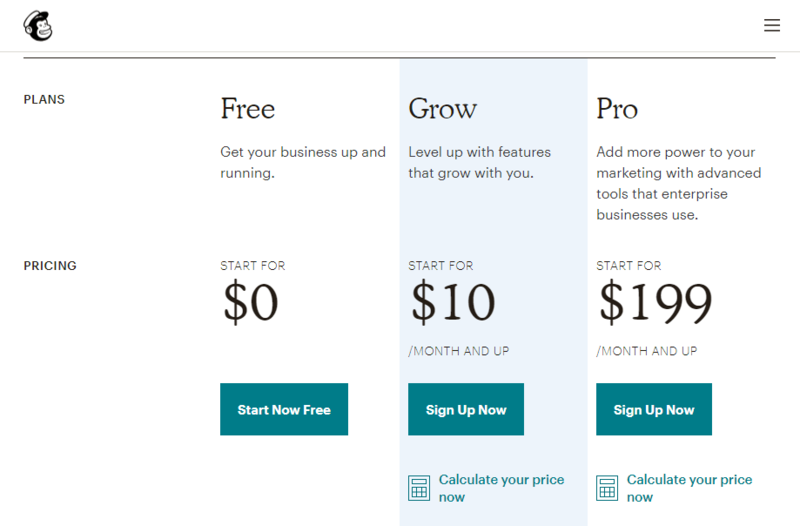 There is zero consistency with MailChimp pricing. With that said, they’re still far and away cheaper than Klaviyo. There is no denying that ActiveCampaign is a very powerful tool. However, unlike many tools in this list, ActiveCampaign has the look and feel of a CRM as opposed to an email marketing tool. You feel this right from onboarding- where other tools encourage you to create your first campaign and connect your online store, ActiveCampaign prompts you to add a contact list. One of the most beneficial things about ActiveCampaign is that it works well if you have multiple domains to manage. As you don’t directly connect one domain to ActiveCampaign, you can choose which domain to assign your campaigns to. 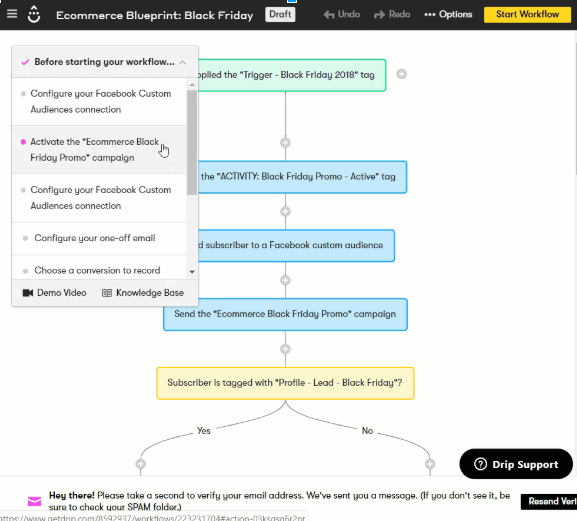 ActiveCampaign joins MailChimp and Omnisend in the best email campaign builders shortlist, and integrates with a variety of ecommerce platforms. However, ActiveCampaign comes with a pretty steep learning curve. If you’re a seasoned marketer with technical knowledge, you shouldn’t have a problem- but it’s not the most user-friendly tool I’ve tested. If you plan on using ActiveCampaign as your Klaviyo alternative, you’ll have most of the same features, but you’ll have to plan for getting the tool down. ActiveCampaign’s pricing is based on is based on the number of subscribers you have and what features you want to use. For example, the Lite Plan is $9 a month for 500 subscribers, but doesn’t include the powerful CRM that ActiveCampaign is known for. Each plan has a subscriber threshold for when the price increases: for the Plus plan, it increases to $99 a month at 2500 subscribers, and the Professional plan kicks up to $199 a month at 5000 subscribers. Depending on the plan you choose, scaling can get expensive quickly. Drip jumps right in with a very visual interface. With the focus immediately on workflows, Drip proposes a plethora of potential automations to start off with. 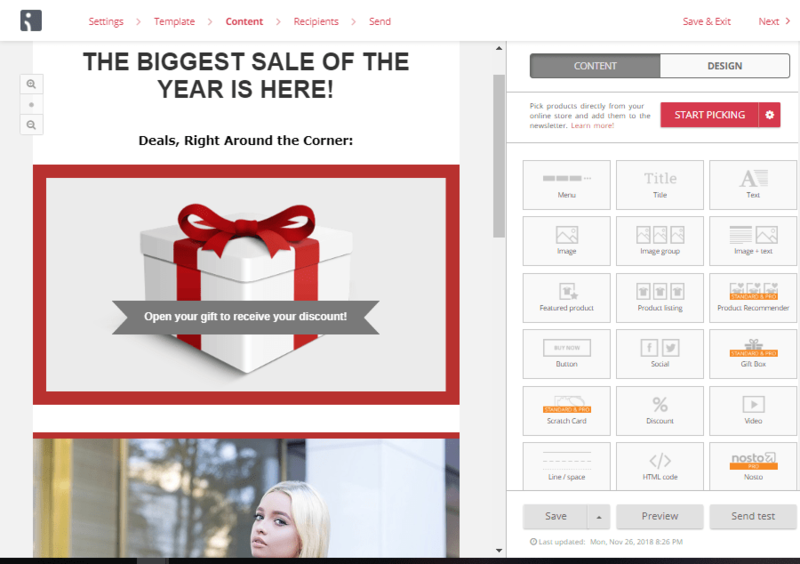 Drip’s visual editor leaves a bit to be desired when compared to other email marketing tools in this list. Unlike most other campaign builders that work based on blocks, emails in Drip are divided into the header, message, and footer, without a whole lot of room to customize in between. I like that it’s color coded and you see a clear funnel of communication, which I feel is easier to understand at a glance. But ultimately everything in Drip seems geared towards people who are really just starting out with email marketing and automation. 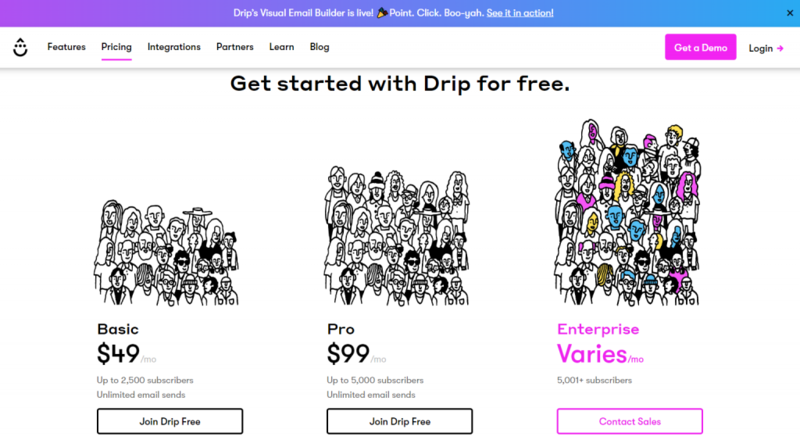 Drip doesn’t offer many of the features other email marketing tools, but it does offer the potential to have a third party provide it for you. For example, you can’t create landing pages in Drip, but you can integrate other tools like UnBounce and Instapage to get the job done. Feature for feature, Drip may not measure up as an alternative to Klaviyo. However, if you just need some basic things and don’t mind integrating third parties for the rest, it might work for you. Drip’s pricing is based on the number of subscribers you have. It seems like the plan and features don’t vary between plans, and it’s purely based on the subscriber count. The Basic plan covers you for up to 2500 subscribers for $49. The Pro plan covers you up to 5000, and anything more than that can be calculated for monthly cost via a site calculator. The first impression that I get from SmartrMail is definitely geared towards those who just need a bit of marketing automation and emails, without any of the fancy bells and whistles. It gives you the ability to send basic automated email sequences and create simple popups for email capture. What’s interesting about SmartrMail is that they propose different auto-updating segments for your email lists, like customers, one-time customers, loyal customers, and at-risk customers. You can also create your own segments based on profile data, campaign and shopping behavior. Unlike other Klaviyo alternatives, SmartrMail is purely an email marketing tool. There is no integration with Google retargeting, no landing pages, no SMS marketing. But if email is all you need, this might be enough. 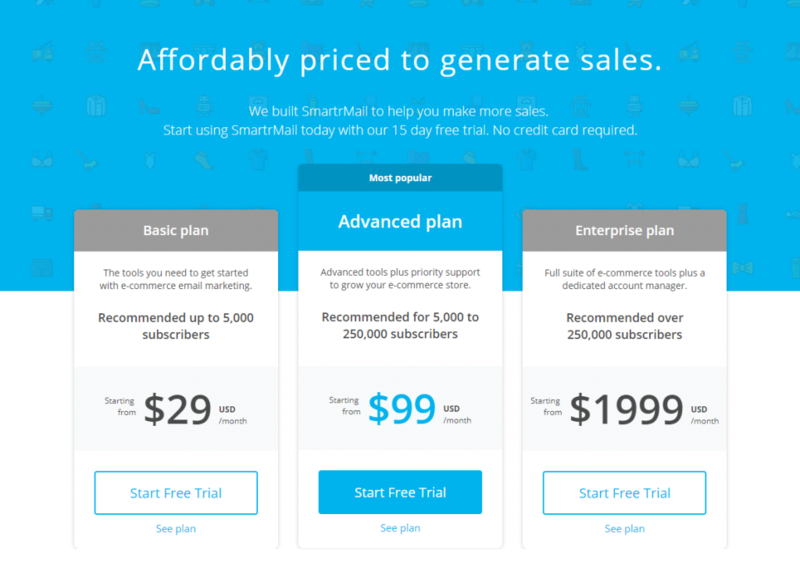 SmartrMail doesn’t offer a free plan, but you can test any plan for 15 days for free. Their pricing system is based on which of their features you’d like, but are recommended for certain subscriber counts. With that said, their pricing scales hard and quick: $29 per month for a Basic plan, then the price jumps to $99 per month for the Advanced plan, and then $1999 a month for their Enterprise plan. SendinBlue offers automated email and SMS campaigns for those who are looking for something simple, yet effective. 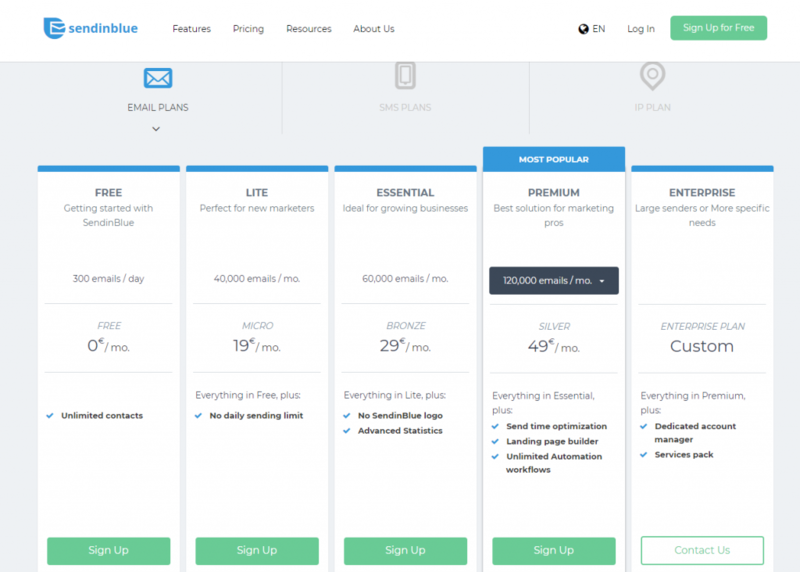 Their email builder, while a bit limited, is one of the better visual builders in this list. They also offer SMS touches with your subscribers, something that only Omnisend and ActiveCampaign do, and MailChimp does for certain countries. 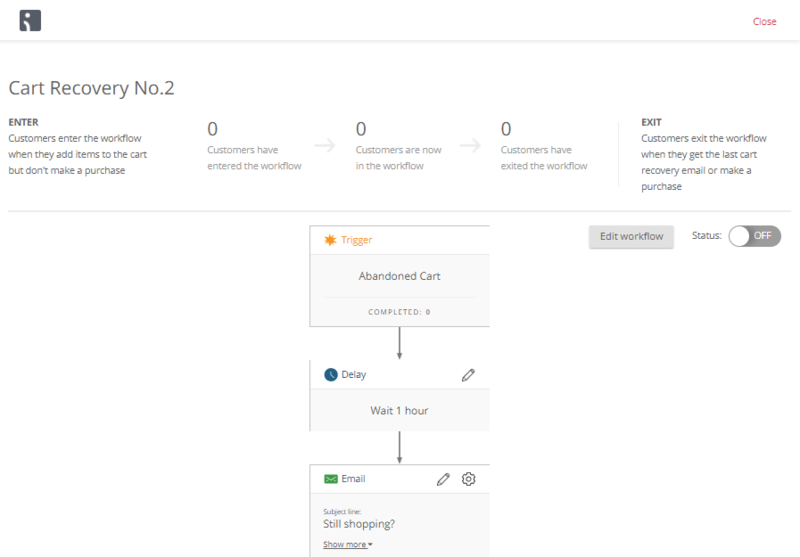 They also propose several kinds of workflows based on user behavior that can inspire merchants to create different automated flows. 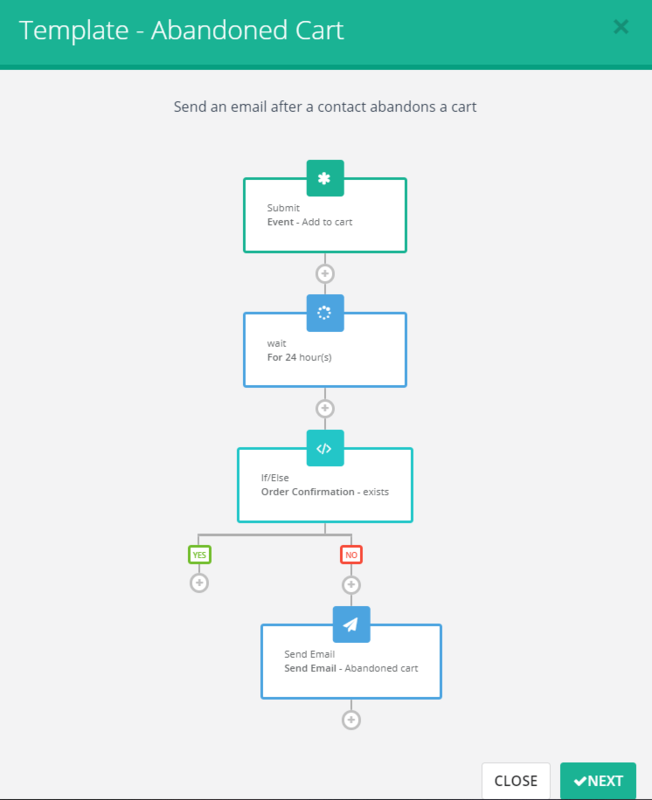 Again, the flow is very visual, which is great for seeing exactly how your automation funnel is laid out. As a Klaviyo alternative, SendinBlue can work if you don’t need anything too fancy. But if you need to scale quickly, you might want to turn to another Klaviyo alternative in this list. SendinBlue, unlike most other email marketing tools, base their pricing not off of subscriber count, but off of how many emails are sent per month. They do offer a free plan for up to 300 email sends per day. As there’s no contact limit, you can have 300,000 contacts if you wanted, as long as you’re only sending 300 per day. For their plans, they start off their Lite plan at $25 per month for 40,000 email sends where the daily sending limit is lifted. From there, you go to the Essential plan at $39 per month for 60,000 email sends, plus more statistics and removes SendinBlue’s logos. They have two different Premium plans, “Silver” at 120,000 email sends for $66 per month, and “Gold” at 350,000 email sends for $173 per month. 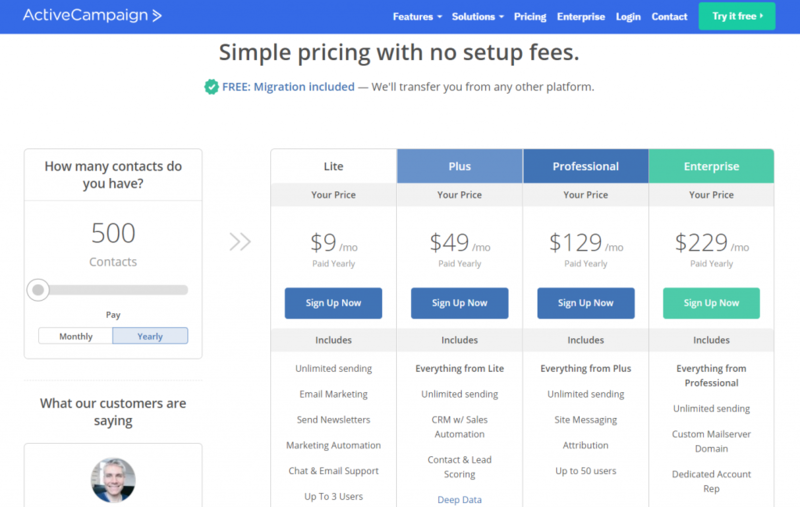 While this way of pricing seems interesting at first glance, it may be a bit more confusing. Say you want to send your 6000 subscribers about 7 emails per month (with wiggle room for your automated emails), you would easily hit the 60,000 emails per month in the Essential plan. But if you have a lot of subscribers and only need to contact them so often, this might work out for you. I’ve set up a few quick references below based on key features each tool offers. I’ve rated email builders based on features and ease-of-use, and then ecommerce integration based on how many different and relevant ecommerce platforms integrated with each tool. There is also a quick reference pricing table to show you a ballpark of how much you would pay based on your subscriber count for the each tool’s standard plan. Regardless of how you want to go about your email marketing efforts, choosing the right tool is critical to your success. By weighing the pros and cons of each of the many tools out there, you can choose the right email marketing app for your ecommerce store. 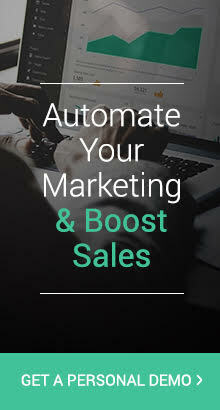 For more comparison about marketing automation solutions check Betterbuys reviews. 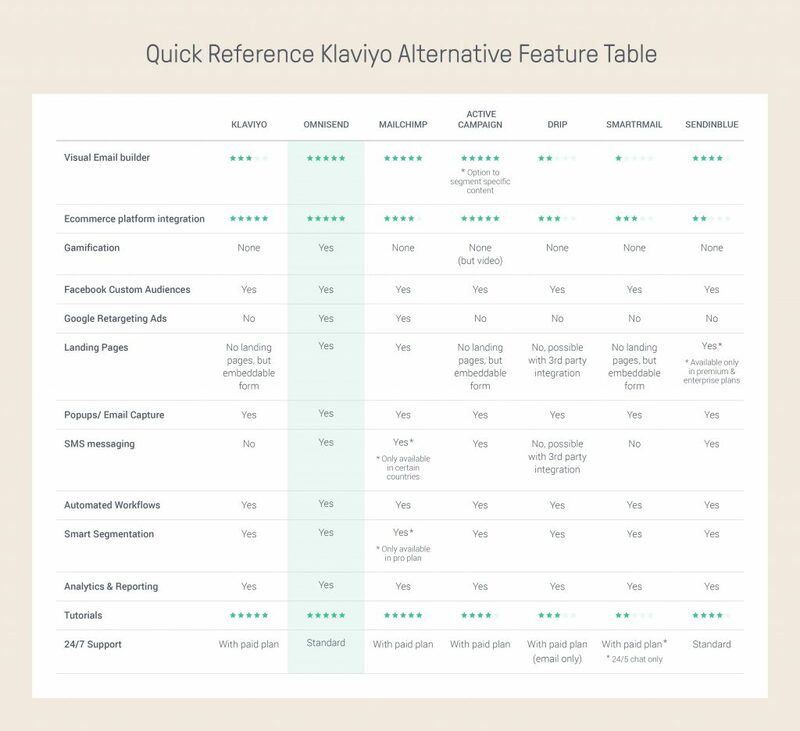 While every tool may not be for you, there are plenty of Klaviyo alternatives that won’t cost you so much per month for the same great features.